Digital technology has been showing an unstoppable growth rate for the past decade. Humanity has come from the first iPhone to the cloud computing, to the mixed reality, to paying for services with their phones and fingerprints. Seeing all this change happen before their eyes, businesses try to go in hand with time. Companies take measures to ensure what they offer is what today’s customer needs. 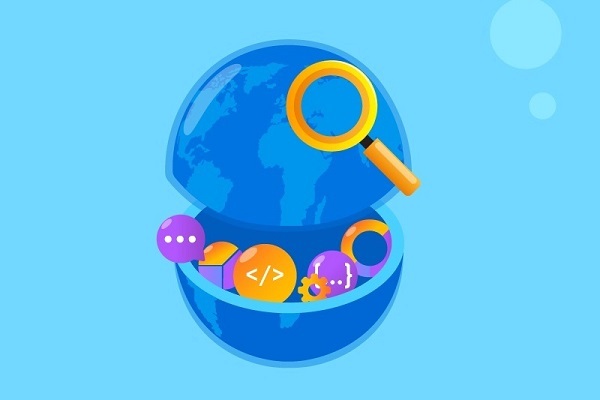 However, in a hectic rush to develop a new user-friendly product or a platform to raise customer satisfaction, companies have little to no time looking for the right tech experts. Thus, they decide to outsource, but laying their hands on a trustworthy business partner with the required skills is also troublesome. Where to start? What to consider? In this article, we’re going to talk about one of the common outsourcing destinations – Eastern Europe – and what you can find there. Eastern Europe has established itself as one of the world’s best software outsourcing destination. Its IT sector offers an impressive diversity of tech professionals, developed infrastructure and provides a good educational background. Countries such as Ukraine, Belarus, Poland, Romania, Czech Republic and a few others we’re talking about in this post have been acknowledged for their sustainable growth and adoption of the latest technological advancements. Having so many options laid out before you, you may find it difficult deciding what country or city to consider first. So we have put together an overview of the most common destinations for outsourcing software development in Eastern Europe. Why should you consider outsourcing to Eastern Europe? The Ukrainian market of IT services has shown steady growth through the years. Outsourcing reminds the leading segment of Ukrainian IT industry with $3.6 billion in 2017 (grew by 20% in comparison to 2016). The Association “IT Ukraine” expects the export of IT services to reach $4.5 billion in 2018. Right now IT industry makes 3.34% of Ukrainian GDP. In Ukraine, businesses can expect to meet a range of benefits beginning with extensive tech expertise, to cost-effective development teams and world recognized engineering education. Having over 1K companies, whether it’s outsourcing, product or a promising startup business, Ukraine offers a wide range of IT-related services. The DOU.UA-based survey shows an astonishing number of over 130K IT professionals occupied in developing fintech, healthcare, gaming, automating, manufacturing, managing, IoT, AR/VR software. Ukraine is home to over a hundred R&D subsidiaries of famous international corporations like Microsoft, IBM, or Samsung. 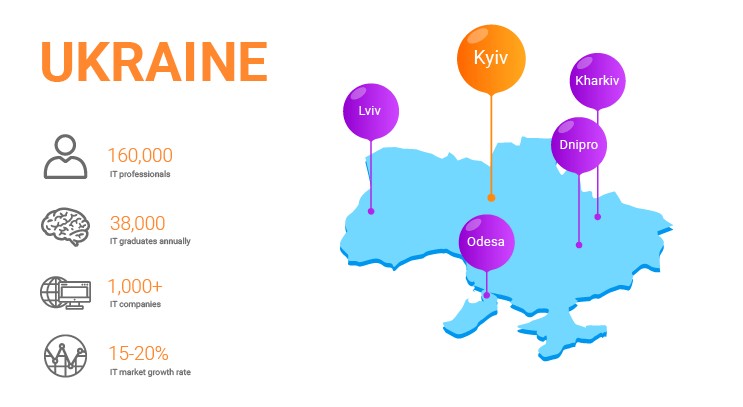 Having been recognized by Gartner as one of the Top-30 offshoring and outsourcing destinations, Ukraine is a great place to contract out your IT needs. Despite that, the IT sector in Belarus still doesn’t account for a major share of the economy with 2.2% of employment rate and 5.1% of the country’s GDP, the IT revenues have reached $4 billion in 2016 ($1.15 million from export). The Sphere of Informational Technologies continues to stand out among the other sectors with stable revenue growth, solid export rates, and continuous flow of foreign investments. It is less exposed to regular economic shocks, making this sector pretty attractive to foreign investments and new projects. 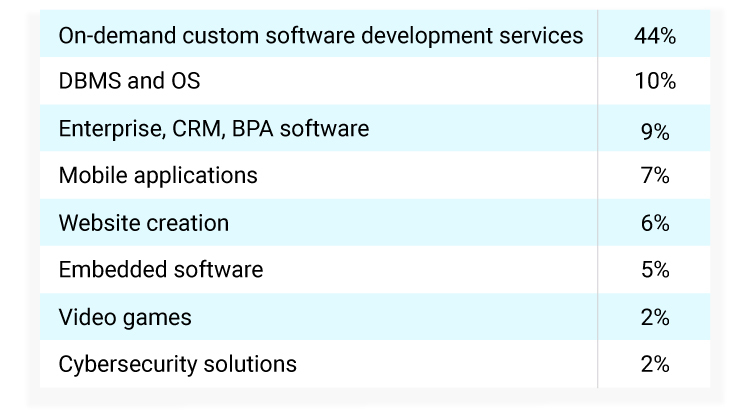 Moreover, some of the major Belarus IT companies were mentioned in the Software Magazine’s Software 500 ranking of the world’s largest software and service providers and were recognized by the International Association of Outsourcing Professionals (IAOP). Relying on the data provided by the Romanian Software and Services Association, the growth of IT industry in Romania has amounted to $4.2 billion in 2017, providing for 5% GDP growth. After Romania became a part of the European Union in 2007, it started to attract global tech companies like Huawei, Ericsson, and Microsoft. According to A.T. Kearney’s 2016 Global Services Location Index, Romania ranked 13th due to its financial attractiveness, people skills and availability, and business environment. Despite that, Romania still lags behind in technology activity, the Romanian government has created and successfully implemented a law on tax exemption for “software development activities” to trigger and support the IT sector’s development. It basically made Romania a true fiscal paradise, especially for investors. Occupying a top 10 position in both Europe and worldwide regarding certified IT specialists, Now it employs over 120K professionals, of which 60K are engulfed in the software outsourcing. Currently, it is a great place to offshore the development of a promising project or start a company. Read Also: Outsourcing Romania vs Ukraine. Which Country Suits Your Needs? Being one of the EU’s fastest-growing economies, it has become an attractive outsourcing location for various European organizations. It has over 140K professionals working in nearly 450 companies specializing in offering IT outsourcing services. Moreover, annually the country receives over 15 thousand technical specialists that graduate from the state’s universities. In 2016 the volume of Polish IT market reached $7.9 billion, ranking them #25 among the most innovative countries in the world. On the other hand, being a member of European Union with a strong well-developed economy and stable political situation, Poland is not a place where you will be able to save by outsourcing software development. However, here you will find a lot of highly qualified human resources. Finally, we have cleared up on the situation on the IT markets for the most common destinations for outsourcing software development in Eastern Europe. Now we are going to tell you a bit about where to look for the best technical vendors. When it comes to information technology, Russia isn’t a destination people think first about. Most profitable industries there include fossil fuel and energy, machinery, agriculture, metallurgical complex, and petrochemicals. However, this doesn’t mean local businesses and human resources are lagging behind the tech revolution. Being world’s largest country by area, Russian Federation represents an enormous labor pool in IT industry. As local governors report, 15,000 IT companies are registered in Moscow, the capital of the country and one of the biggest cities in the world, without counting down the rest of the companies located in distant regions. According to Russoft survey, there are 470-480,000 technical specialists working IT departments of various enterprises in Russia. About 137,000 of them dedicate their careers to the software development sphere. Tech hubs of the country include Moscow, Saint Petersburg, Nizhny Novgorod, Novosibirsk, Kazan. The business focus of the Russian IT industry is rather unique for the Eastern Europe region. The vast majority of companies there rarely limit themselves with one direction to export their services and/or programming products to. Asia (especially China and South Korea) and Europe (Germany in particular) choose to outsource to Russia and open R&D offices there. Unlike the US, who actually continues to close/scale down their R&D’s there and terminate the contracts with outresourced teams of Russian origin. Yet still, 70% of companies that took part in Russoft survey, admit they export software development services to the US (for the European Union this number equals to 66%).In the last couple of years IT outsourcing sector in Russia declined from 55% market share to 46%, while R&D centers shortened from 15% to 7%. The membership in European Union and relatively high English language literacy make Bulgaria a remarkable spot on the IT outsourcing map. Due to the great geographical location of this country — on the Black Sea coast, at the crossroads of East and West — it’s been worldwide famous as a budget-friendly tourist destination. This also adds points to easy and fast travelling, especially for the EU countries. Bulgarian IT industry accounts for 24,000 programmers and about 400 software development companies. The absolute majority of them is accumulated in the following cities: Sofia (the capital that locates more than 30% of all Bulgarian developers), Plovdiv, Varna, and Burgas. IT human resources pool grows in 2,000 tech graduates annually, which is not enough to cover the 3x higher market demand. According to Weastra, Bulgaria holds 8th place by the number of developers globally. Also, same resource reports that 53% of all the developers there have ICT (Information and Communication Technology) certifications. 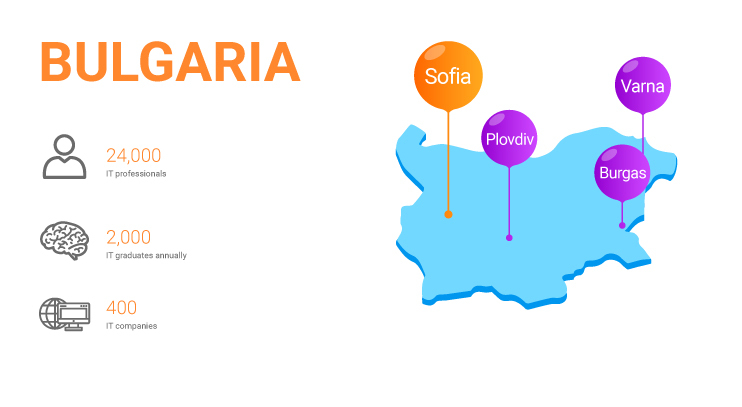 In 2016, Bulgaria also ranked 2nd in Europe and 7th globally among the most attractive IT outsourcing locations in the Business Process Outsourcing and Shared Service Location Index. The biggest IT employer in Bulgaria is worldwide famous technical giant Hewlett-Packard Enterprise (HP) with headquarters in Palo-Alto, USA. This company runs an office in Sofia and employs 6,000 people there. The top popular programming languages in Bulgaria include Python, .Net, Java, and PHP. On the human resources market, the demand for pythonistas is the highest, which is naturally influences the higher salaries amongst them. Senior Python developers typically ask for $2300-3500/month, while .Net or Java senior-level programmers gain from $1700 to $2800 per month. The Czech Republic is another highly appreciated IT outsourcing destination for both Western Europe and North America. More than once, this country has been recognized for high ROI in Information and Communications Technology (ICT) sector and acknowledged as a great business process outsourcing by such companies like Google, Microsoft, Oracle, IBM to name a few. 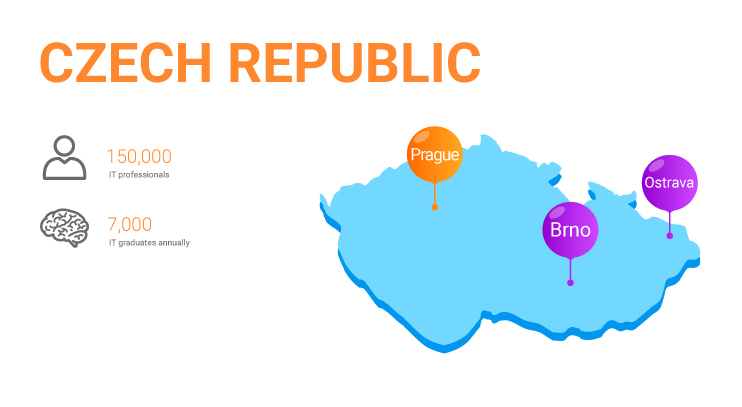 Excellence in technology, large IT talent pool, comfortable location, and Western-oriented mindset are topping the long list of reasons for Czech Republic being a favourite for many tech enterprises around the globe. Currently, Czech IT industry boasts 150,000 employees working in hundreds of software development and ICT companies throughout the country. The majority of them accumulates in Prague, which is Republic’s capital, Brno, and Ostrava. In the last few years, Prague managed to build a very welcoming environment for IT startups (including such honorable mentions as Skypicker, Endrophina, and Invea) and upcoming entrepreneurs due to its relatively low living cost and high English literacy amongst the citizens. About 7,000 students graduate in ICT programs annually and join the local tech workforce. Hungary is a slightly less popular on the IT outsourcing arena option, yet a very promising one. Since 2004, when Hungary became an official member of the European Union, local software development sector started to grow at a rapid pace, and seems like it’s not going to stop anytime soon. The relatively smaller scope (Hungary has about 10 million citizens) of this country does not affect the size of local IT talent pool — Hungarian IT industry accounts for 150k specialists. On the top of that, Hungarian tech universities graduate at least 6,000 young specialists yearly. IT hubs of Hungary include Budapest (the capital), Debrecen, Pécs, Szeged, and Miscols. Most spoken language in the country is Hungarian, and English literacy is on intermediate level amongst the citizens, including local software developers. The biggest IT employer in Hungary is the company titled IT Services Hungary, which employs around 4,000 people in its offices throughout the country. It runs a subsidiary called T-Systems that distributes back-office services to foreign clients mostly from Western Europe. Other than local IT companies — whether they choose to outsource software development or distribute their services and products within the country — Hungary is also a well-known destination for R&D purposes. Such industry leaders as IBM, EPAM, Nokia, Microsoft, HP, and Lufthansa have opened their R&D facilities in Hungarian tech hubs years ago. How to Find Software Development Outsourcing Company in Eastern Europe? Try going through your personal network. There are solid odds some of your friends or acquaintances actually know a good firm. Surf the net. Online directories of forums are going to give you an understanding of what you are in for. Go through specialized websites like Clutch, ContractIQ, AppFutura, or GoodFirms. There you will find reviews of company’s work, their portfolio, and much curious stuff. Turn to local IT communities. For example, Ukraine has a number of local IT Clusters, e.g., Kyiv IT Cluster, that offer to set clients up with the most suitable outsourcing companies. In a DevOps environment, the entire team is responsible for releasing new features and app improvements. The combination of a shared code base, continuous integration, automated testing and deploys results in more reliable releases. Improved communication and cooperation processes between departments streamline bug fixing at any development stage. If you have more questions about how to find a software development company, go read our extensive article about it. Eastern Europe is a truly promising region for offshoring software development. There are thousands of skillful IT specialists from programmers to designers and managers who offer high-quality services for a fair price. If you are searching for a company to do offshore software development, come to IDAP. We offer a wide range of services from iOS and Android mobile development, to the construction of complex business management systems like ERP or CRM.